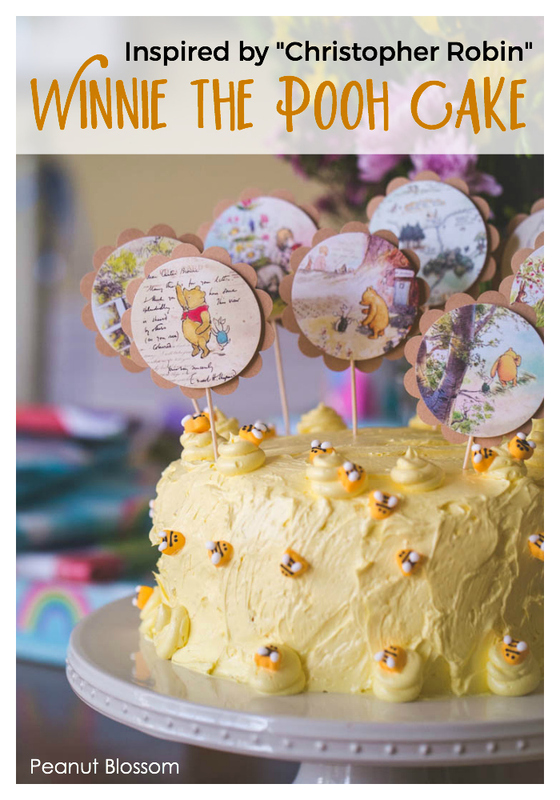 A super easy Winnie the Pooh cake idea that is perfect for Tweens and other grown-up Disney fans. 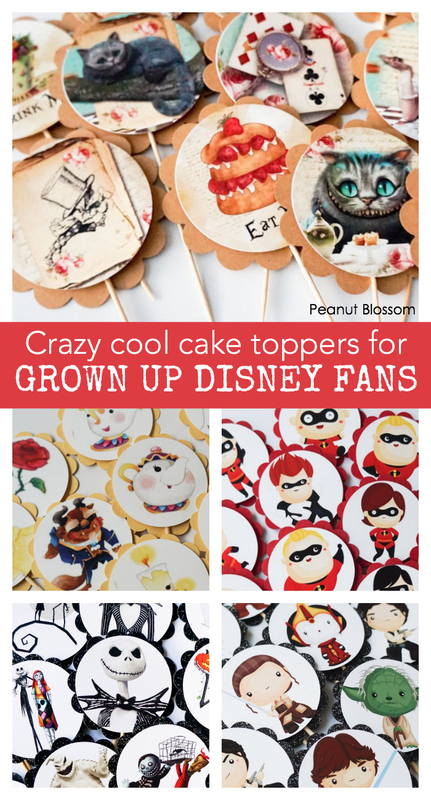 Don’t miss the best Disney cake toppers at the bottom of this post. Growing up can be so rough. 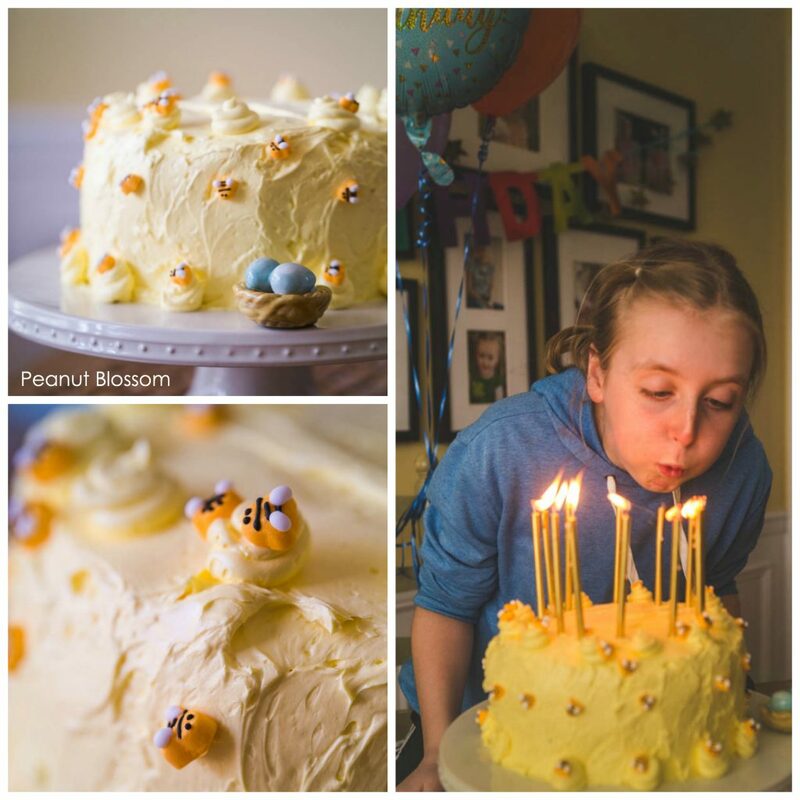 We are starting to feel that more and more around here as the Peanut turned 12 last week. Every year we do a birthday theme, even when we’re just celebrating here at home with our little family. 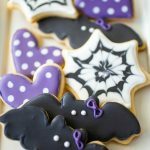 Her party themes have always represented her favorite things at the moment: rainbows, Big Hero 6, artistic endeavors, Harry Potter, and even a hysterical flamingo cake. 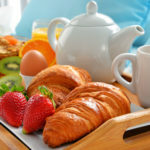 Leading up to her twelfth birthday, I could sense that she was feeling the pain of growing up and watched her struggle when no “theme” came to mind for her this year. One evening, we sat down as a family and watched the new Christopher Robin movie on Netflix. Have you seen it? It is a much slower paced movie than most recent Disney films, but it was heartwarming and adorable. It absolutely touched on the struggles and heartache that come with outgrowing childish things. Each of us loved it. The next morning, the Peanut came to me and asked for a Winnie the Pooh birthday theme. But, not just any Winnie the Pooh. She wanted a Christopher Robin and his 100 Acre Woods-inspired Winnie. If you go shopping for Winnie the Pooh party supplies, you’ll quickly notice that they are intended for Baby’s First Birthday parties. Most of them even have a big fat ONE! as part of the design. That is definitely NOT what either of us intended. I have always been enamored with Pooh bear. The classic illustrations make my heart skip a beat. When we were dating, my husband even presented me with a framed illustration of Pooh and Eeyore at the bridge for Valentine’s Day. So it was with utter delight that I discovered these amazing handmade cake toppers that celebrate those original illustrations in the store Fine Paper Crafts on Etsy. 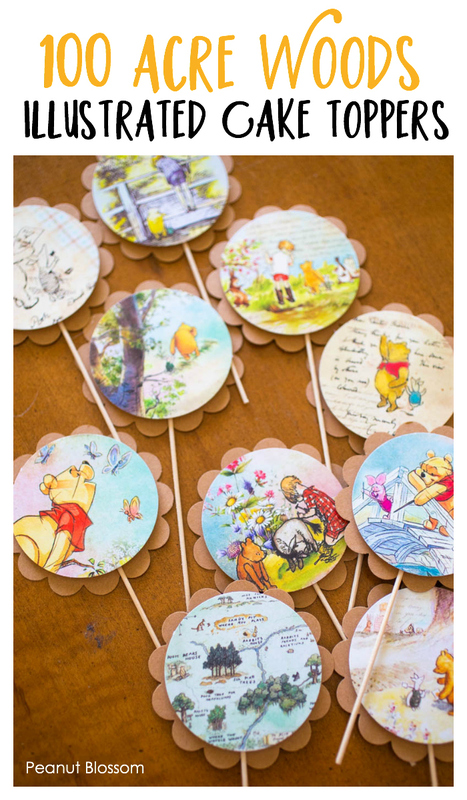 The toppers mix classic Pooh illustrations from the book as well as cartoon illustrator drawings from the movies. 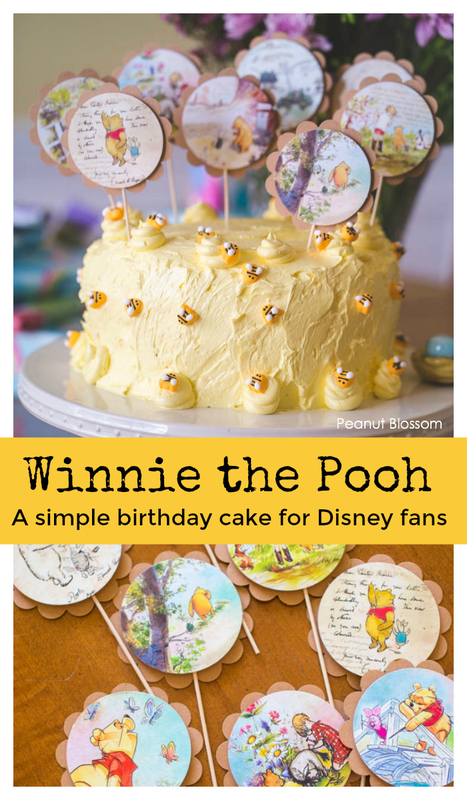 They are the perfect Winnie the Pooh cake decoration for all ages of Disney fans. A cake: I made a two-layer almond chocolate chip cake, a recipe from my upcoming children’s cookbook. It was the Peanut’s favorite recipe during the cake-testing phase so she requested it for her special day. You could use a box cake mix or any flavor cake you desire. Frosting: I made a single batch of this Swiss meringue buttercream but you could use whatever white frosting you desire. Yellow food gel: I used this lemon yellow food gel to tint the frosting the perfect shade of honey yellow. I actually highly recommend just going ahead and buying this entire set of food gels. It’s cheaper per bottle and you’ll have lots of fun playing with them, lemon yellow is included in the set. Candy bees: For the two-layer cake, I purchased two boxes of these adorable candy bees. I just scattered them over the top of the cake in random patterns. A small round piping tip: I frosted the cake as I normally would, you can see my video showing my method here. Then I just put a cup of frosting into a piping bag and piped little tiny beehive shapes using a small round piping tip like the one in this set here. I just swirled little dollops and popped a bee on top. Easy peasy! Golden candles: I removed the paper cake toppers when it came time to light the candles. I love using longer candles because they allow for more time to take pictures and sing without wax melting everywhere. We used these golden candles, she required the whole box! She loved her cake. She felt so special and was so excited about how it all turned out. Is it a perfectly-frosted Pinterest masterpiece? Not at all, but that wasn’t my goal. My entire hope was that my lady would feel important and special on her birthday. I wanted to make her feel like I see who she is and what she loves and understand her. I hoped to ease her transition into teenagerhood with a sweet and simple birthday cake that met her sweet sentimental request. Use a box cake mix. Use a tub of frosting from the store. 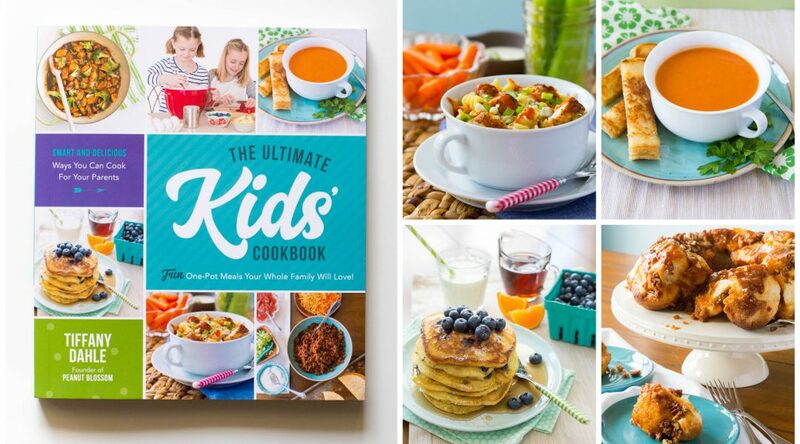 The baking part doesn’t need to be difficult, but invest a little time into finding or making the just-right decorations if you really want your kid to love their cake. That’s the part they notice and remember. Be sure to scroll through their store and be inspired! Check out Fine Paper Crafts here.